Online Teaching takes a new meaning with all those Tutorials floating online for free. Here is one from AdithisAmmaSews. 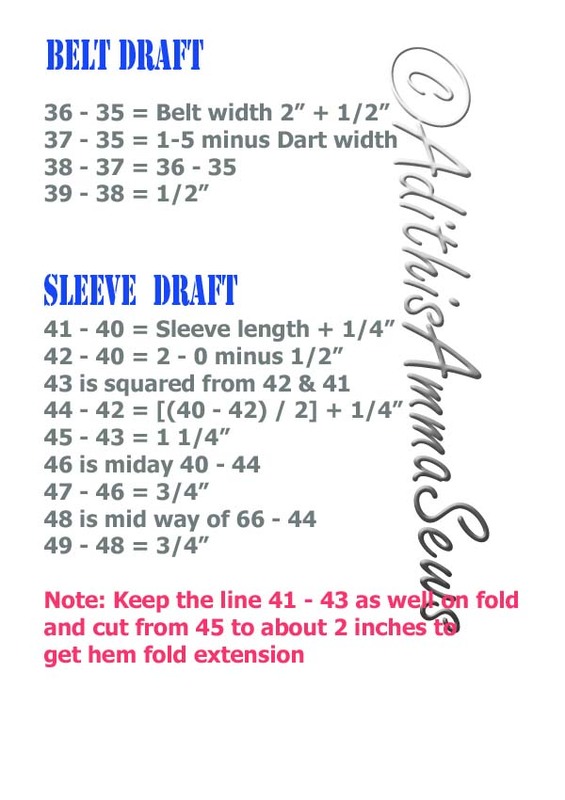 Pattern Drafting Softwares..take a break..here is a hand-drafted pattern from AdithisAmmaSews! Readers have been requesting for Katori Choli AKA Bombay cut choli draft for quite sometime now. Managed to work and get it done using MSPaint & Photoshop at last! Please see the draft. Sewing Tutorial will be posted next week, depending on the response for the draft, so that i can atleast know if people are interested in using the draft, if there are takers, then i shall do the sewing tutorial for the same. 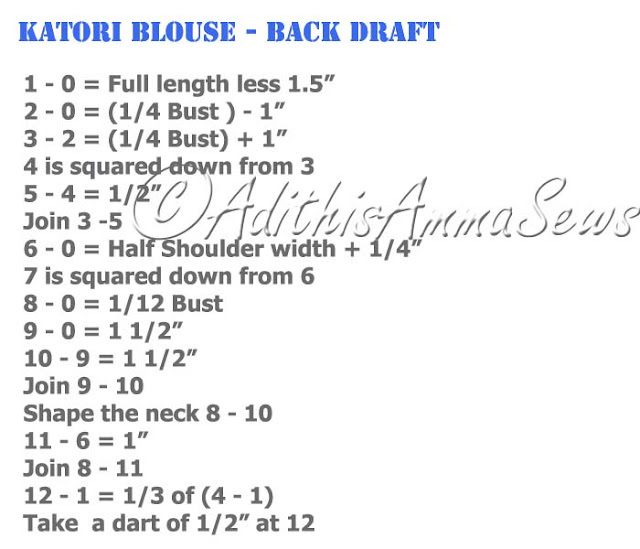 Wow, I have always wondered how the Catori blouse was drafted... I was wondering if you could show the sewing part as well.... I love your blog dear! Thanks Uma for loving my blog. Do spread the word about my Saree Blouse e-Pattern giveaway - ends on Feb 14 2011. 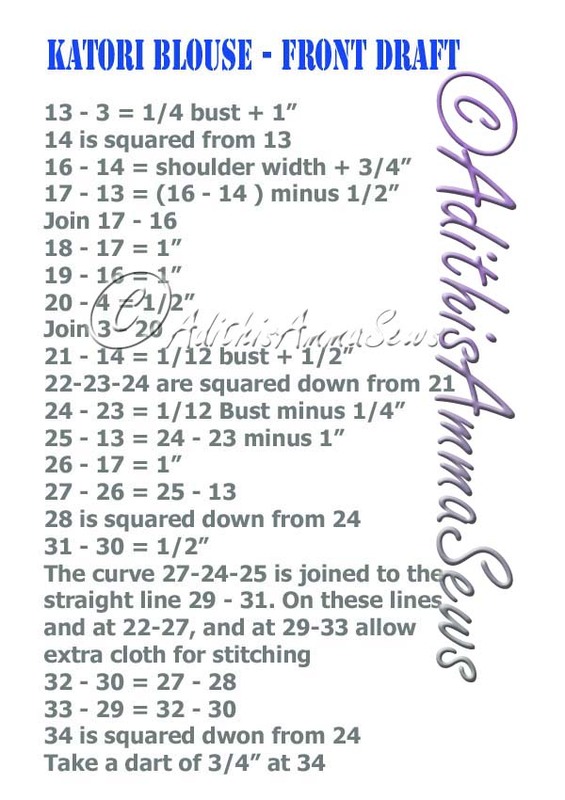 I will surely post stitching instruction for katori blouse, hopefully by Feb end. Thanks AA! can't wait for the tutorials. Question: Is this the same as princess cut blouse? Curious minds want to know. Thanks Kay! AA hmmm new Acronym for me! Katori Blouse is not the same as princess blouse. But is very helpful for heavily busted ladies as its cut is such that the bust portion is nicely supported to separate bust cups rather than all in one blouse front in normal blouse. I will post a picture of katori blouse soon, may be it will help you visualize it. thanks dear AA. i am new user of ur blog and thanks for the tutorials. 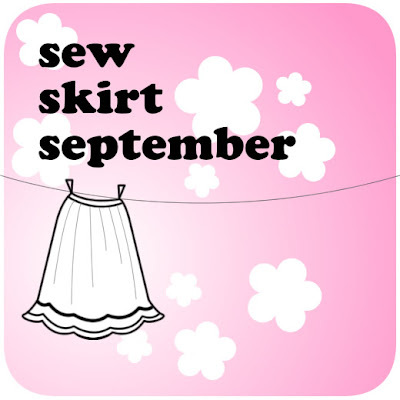 i am learning stiching from ur blogs. Thanks Kokilavani. I am glad my blog is useful to you and many readers worldwide. I would be elated if you start following AdithisAmmaSews as it would help you keep track of my latest posts and at the same time motivate me further! I do admire those who can create patterns. Very nice, I love to see how other people do this. Great ideas, thank you!!! Princess cut is explained in Anarkali Kameez tutorial. Please check the same. 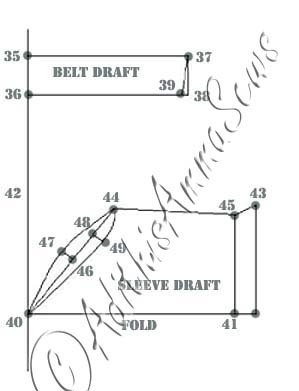 The method is similar and has to be applied to on Saree Blouse Draft. Thanks viji for pointing this out. I will modify the draft picture or add a note at the end to indicate the correction to the readers. Needless to say I have bookmarked your site. Dear Adothis Amma! Can you please help me here, my body look goog for saree , but the same time I have big abdommin.teach me how to cut cut belt for sari blouse?give me some ideas to weare and enjoy the blouse thanks. 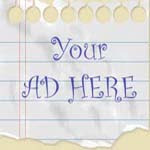 Hi, could you please post the draft picture (the first image) again in a larger size. Its not very clear. Thanks.